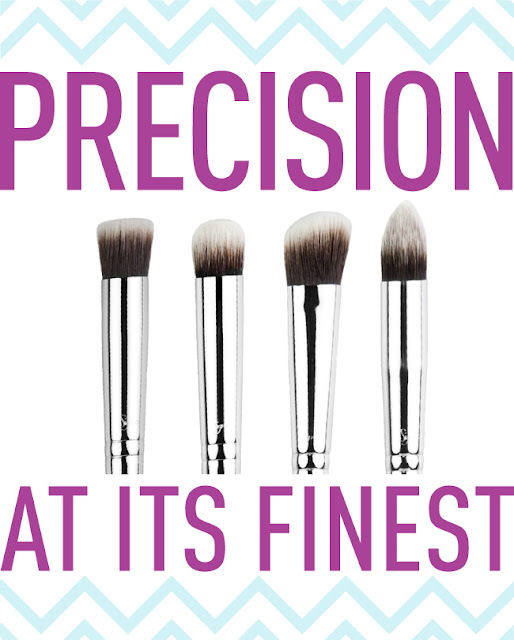 This month we’re giving away our Synthetic Precision Kit – a favorite among Sigma Beauty customers! Each brush utilizes soft Sigmax fibers that provide perfect makeup application to the most defined areas of the face. The brushes were created to mimic your fingertips, allowing for precise application of products such as concealer, eye shadow, or highlighter. This best-selling kit is sure to exceed your expectations! You must be a Sigma Beauty Blog subscriber (through Google Friend Connect) to be eligible to win. Fill out the form below with your name, e-mail address, blog link or YouTube channel (if applicable), and a topic you would like to see on the Sigma Beauty Blog in the future. Our marketing department will choose and announce one winner early next week based on the topic suggestion we feel is best suited for the blog. We love creativity! Not only will the winner receive the Synthetic Precision Kit, they will also have their topic suggestion featured on the Sigma Beauty Blog with mention of their name as well as their blog or YouTube channel! Woohoo! I've been eyeing this kits for a while. Suggestion SENT! Hi, this is Diana Gonzalez. I just entered the giveaway and shared this opportunity with my friends on twitter, facebook, and blogged it. I hope I win I do really need some eye make-up brushes to apply my eye make up and do it with professionalism, lol!! Any Good Luck!! I want to share this giveaway. Go head and enter to win. Your entry has been submitted successfully, thank you! I entered, but Im not sure if my entry went in?! Great giveaway! hope i win the prize!!! I think I've sugested a very fun topic. Would love to try these brushes! Good luck everyone! just enteres! i want to win this so badly!!!! Thank you so much for this. Exciting! Yes, Alta - your entry has been submitted successfully. Thank you! Entere! I'd really wish to win them...! I don't know if I did enter because when I submitted my entry it disappeared from the screen that remained blank without saying that my entry was successfully submitted. Not sure if my entry went in. My screen went blank,where the entry form is located. I hope you got it. I have never won anything in my life! this would be such a great addition to my sigma brush collection. I submitted my entry. Thank you for hosting this giveaway! i'm not sure i sent a correct email first, so i sent again, my form. hopefully it will work now. I want to win. I have almost the entire collection. they must win. My dream consumer! *_*..By.. Brazil !!! I hope I did this right. I submitted my entry and I believe I am following you guys. I guess we will see. Thank you for the opportunity! How can you tell if your entry was submitted?? Thanks so much for this giveaway!! Good luck everyone . I also didn't get a confirmation saying my entry was submitted =(. I hope so! I am sharing this page foe others to enter as well! Oh, I sooo need these brushes. Need! Just entered!!! Good luck everyone!!! This is great giveaway and what better way to transform the Sigma Beauty Blog, then by Sigma fans' suggestions. I am sure many beauty fans will have great ideas. Good luck to everyone! New & Improved, Slim & Slender!